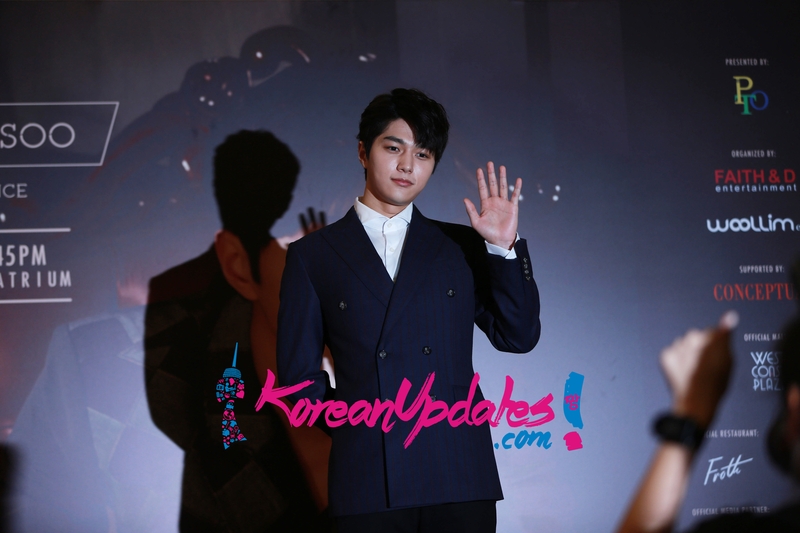 INFINITE‘s L came to Singapore for the fanmeeting to meet his fans last September 23rd. Before the fanmeeting , he had some time to have a public press conference at West Coast Plaza to have a gaterhing with his fans. The actor, Myungsoo, was asked about whats the difference in being an Actor and singer as a L. He said that as L , he recevied motivation from the fans and he needed to sing and dance. However, being an actor (Myungsoo), the fans can see him in different roles and also different persetives of him. He hopes he can attract more fans as an actor , as most of the fans know him through the group of Inifnite but not as an actor. Thus he will accept more roles in the future to let more people know about his acting skills. Myung soo was asked about his choice between friendship and love. he said both of it are important to him and he is greedy as he wants both. If that scene in the drama, would to happen in the real life, he will choose the most realistic way. Most fans know that L loves taking photographs and is a good photographer as he shares his picture sometimes to the fans. L said that he brings his camera to him everywehre and hopes to have a photobook again soon. Myungsoo’s Life Motto is Carpe Diem- seize the day. It is the best advice received from someone which keeps him bear in mind till today. He mentioned that if one is to be in a difficult situation , do not look at it on the negetive mind but look at positively and you will overcome it for sure one day. Myusngoo claimed that he doe not have good memorising skills , as he is not that good at memorising lines and dance moves but he found a method that works on him. The method is just simply repeating it again and again be it during eat breakfast,lunch and dinner. Myungsoo was asked that what he would want to fulfill when he is 30 years old. He thinks that the fans will still see him doing the same thing but in improvised way. He is 25 years old now and is doing his best to express himself, but maybe 5 years later he will be much mature. He hopes to be asked the same question again when he is 30 years old. Korean updates would like to thanks Faith & D entertainment for the invite.